I suspect that most UFO enthusiasts in the West will be surprised to learn that we have had such an event reported on Polish soil. But here perhaps is an even bigger surprise - we have evidence of THREE such crashes! 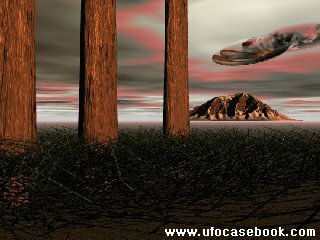 1) In the summer of 1938 in Czernica, near Jelenia Gora (Jelenia Gora Province), a UFO crashed in the area. According to Soviet and Russian authors, evidence and wreckage recovered from the crash site was seized by Nazi Germany after the invasion of Poland one year later. This inspired Nazi scientists to construct a "disco-plane" which they labelled the V-7, (the 'Haunebu' or 'Vril'). Others refer to it as the Ay-7 or Be-7. 2) On 21 January 1959, in Gdynia, a bright, shining body crashed into the harbour basin. One and possibly two EBE's (Extraterrestrial Biological Entities), were found and recovered by soldiers of the Border Guard or the Navy. These were next transported under tight security to the Soviet Union, where they remain to this day. Possibly the most interesting attraction was the showing of a television documentary which had been made by the NHK TTC (Channel 8) of Tokyo, which focused on an alleged UFO-crash in Gdynia, Poland, on 21 January 1959. This film was shown at the Gdansk UFO-Marathon, October 12, 1997. 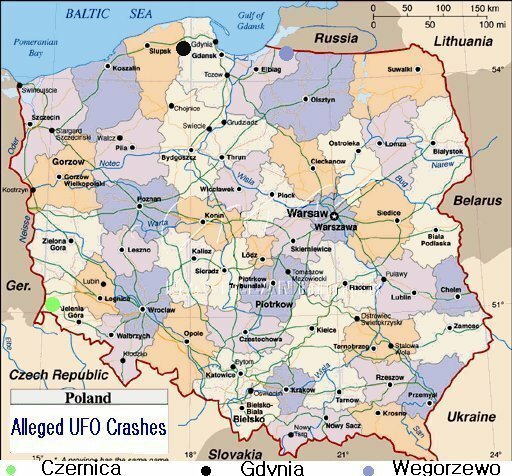 3) On 15 March 1997, close to the town of Wegorzewo, Suwalki Province, a UFO was seen to explode in the air before crashing to the ground at 5:00 pm. Its remains were immediately gathered by soldiers of the Polish Army. The Army denied all knowledge of the incident at the time, but since then, Army spokesman Col. Zdzislaw Czekierda of the General Staff, has publicly stated that "...the General Staff of the Polish Army have had a special division which gathered and evaluated all information about UFO sightings and close encounters with aliens since the early 1980s". How many high-ranking military officials in the West have come forward to make such startling admissions?